The church grounds have been reorganized to create a sacred space to honor those slain, as well as a garden space to honor the survivors. 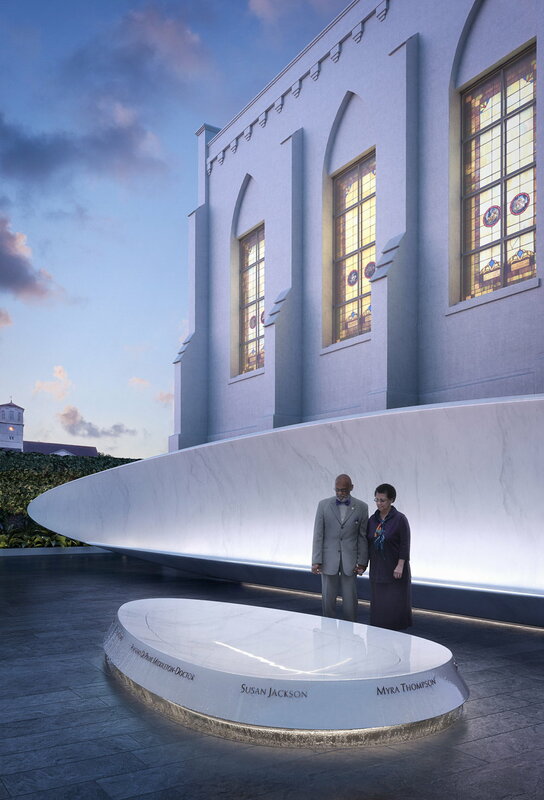 The memorial features a courtyard with two fellowship benches, facing each other with high backs that arc up and around like sheltering wings. At the center of the courtyard, the curves of the benches encircle a marble fountain where the names of the Emanuel Nine are carved around the fountain’s edge. Water emanates from a cross-shaped source, filling the basin and gently spilling over the names of the nine. The opening between the benches toward the back of the courtyard reveals a cross above a simple altar, providing visitors a quiet place to linger in thought and prayer. "This memorial on the grounds of the church will help keep the memory of the Emanuel Nine alive and honor the resilience of the families, survivors and church members." The Emanuel Nine Memorial welcomes people of all backgrounds, faiths and walks of life to come together to realize positive change. The marble fountain at the center of the stone benches is inscribed with the names of the Emanuel Nine. Water surfaces through a cross-shaped source, filling the basin and gently spilling over the names that include Rev. Sharonda Coleman-Singleton, Mrs. Cynthia Graham Hurd, Mrs. Susie J. Jackson, Mrs. Ethel Lee Lance, Rev. DePayne Vontrease Middleton, Rev. Clementa C. Pinckney, Mr. Tywanza Kibwe Diop Sanders, Rev. Daniel Lee Simmons, Sr., and Mrs. Myra Singleton Quarles Thompson, AME Licentiate. Please help realize the Emanuel Nine Memorial by donating today. On the Donate2it page you will be able to enter an amount or select a donation level. The Mother Emanuel Memorial Foundation Board was established as an independent 501(c)(3) organization to support the mission of the Emanuel 9 Memorial. The Board manages the fundraising, construction, endowment, and outreach for the memorial.